What I hope for in 2015 is for more system exclusives. I know this is an unpopular opinion due to the fact that owning all three systems is expensive, but I feel with a system exclusive, you are showing that with the purchase of that system (XboxOne, PS4, Wii U) you are getting something that you can’t play elsewhere. Nintendo made headlines when they helped make Bayonetta 2 possible, to which people who never owned a Nintendo system found themselves having to get a Wii U for that experience. With Street Fighter V coming to PS4 and PC and what looks to be like the next Tomb Raider on Xbox One and Xbox 360, companies (Microsoft, Sony, and Nintendo) want to make sure you are getting a great value for third party and system exclusives. Unless you’re Nintendo, then you are relying on first party studios and indie support. Also, I hope that after the disaster known as Halo: The Master Chief Collection and Assassin’s Creed Unity that the gaming media will no longer go soft on games that have a rocky start. Makes me wonder if the next Elder Scrolls game will face this issue. Bottom line, I expect reviews to be more honest if the game faces an issue on launch, and maybe do an update after a month to see if the issues have been fixed. I expect 2015 to be a standout year for gaming with many great triple A titles dropping for the Wii U, PS4 and XboxOne. I expect to see the momentum the Wii U gathered towards the end of 2014 carry on to next year with the likes of Splatoon, the new Starfox and the new Zelda dropping. I also expect to see continued success for PS4 seeing as they have more indies and hard hitting exclusives coming. The games I am most looking forward to in 2015 are: Bloodbound, Splatoon, Uncharted 4, The Witcher 3, and Until Dawn. What I want to see most for the upcoming year is more developers taking risks and thinking more outside the box to give us gamers new experiences. I also want to see Microsoft bring more competition to Sony by bringing out new exclusive games and giving me a reason to actually purchase their console. All in all, I’m expecting 2015 to be a very happening year for us gamers and our empty wallets will be the proof of that. Although 2014 should overall be considered a down year for video games, Nintendo’s success shouldn’t be ignored. A lot of great Nintendo exclusive games came out that put Nintendo back in the mix as a serious contender to be in your household next to, or instead of a Playstation 4 or Xbox One. I want to see Nintendo build on their 2014 success into 2015 with more games. 2015 needs to be a year for the Playstation 4 and Xbox One to put out great games that sets them apart from each other to make them contenders for gamers’ wallets (like mine). 2014 was a year of broken releases and technical problems at launch. The one silver-lining is that a lot of press was made due to these problems so maybe, just maybe, the various developers and publishers got the message loud and clear. As technology increases in the video game industry, it is necessary that criticism is also on the technical side of video games in terms of frame rate, bugs, and multiplayer stability. As a PC gamer, I want to see more respect towards the PC community. Broken PC ports of console games was a problem in 2014, that I hope is better in 2015. In 2015, I’m keeping my eye on No Man’s Sky, Uncharted 4, The Witcher 3, The Division, Arkham Knight, and King’s Quest: Your Legacy Awaits. 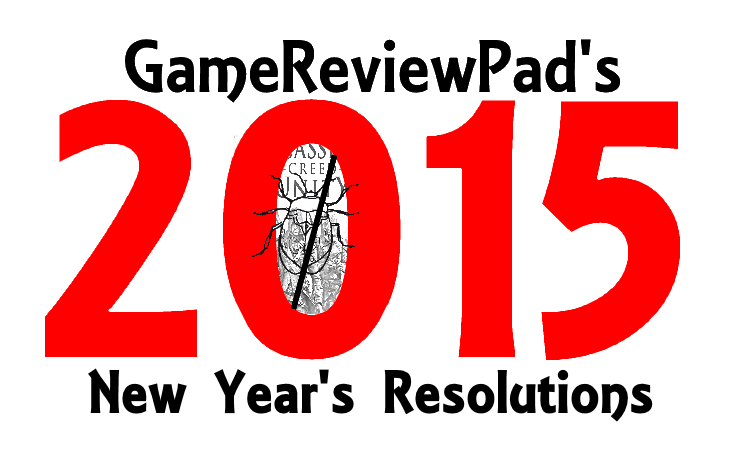 Thanks to everyone who supported GameReviewPad in 2014 by either contributing, reading, or listening to the podcast! I hope you continue to support us going forward.